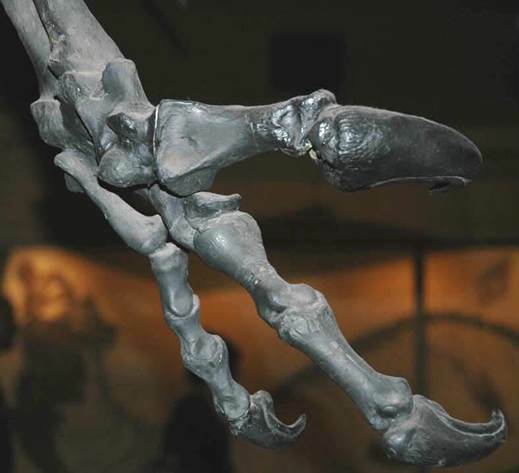 Theropod were small to large, bipedal dinosaurs. Almost all known members of the group were carnivorous (predators and/or scavengers). They represent the ancestral group to the birds, and some theropods are known to have had feathers (see Sinosauropteryx below). 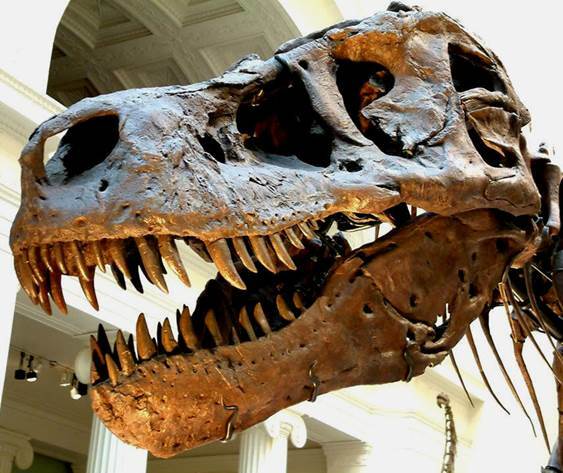 Some of the most well known dinosaurs to the general public are theropods, such as Tyrannosaurus, Allosaurus, and Spinosaurus. 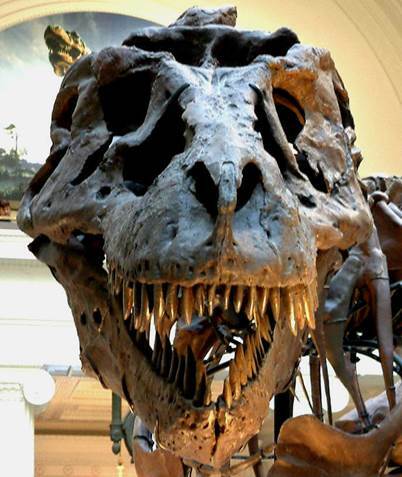 Tyrannosaurus rex is the most famous theropod dinosaur. It was a large bipedal predator in western North America 65 to 68 million years ago, during the latest Cretaceous (Maastrichtian Stage). 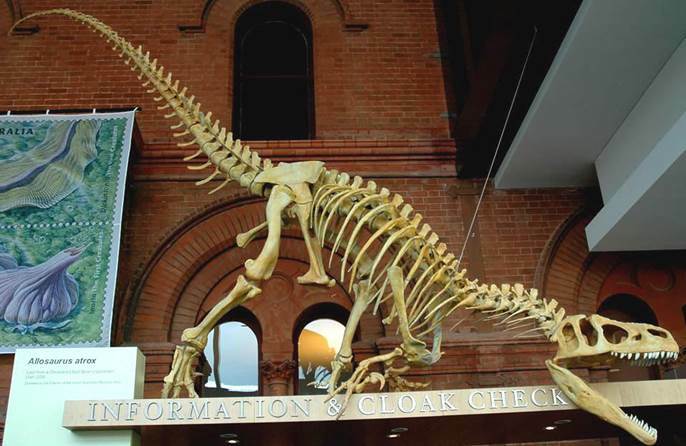 The most famous specimen is FMNH PR 2081, nicknamed “Sue”, housed at Chicago’s Field Museum of Natural History. The specimen was stolen from its discoverers by the American government (greed always brings out the worst in everyone) and was eventually auctioned for $8,362,500. It was bought by McDonald’s and Disney on behalf of Chicago’s Field Museum, where the actual skeleton is on permanent display. In addition to the skeleton, two complete replicas exist: one owned by McDonald’s and one owned by Disney. 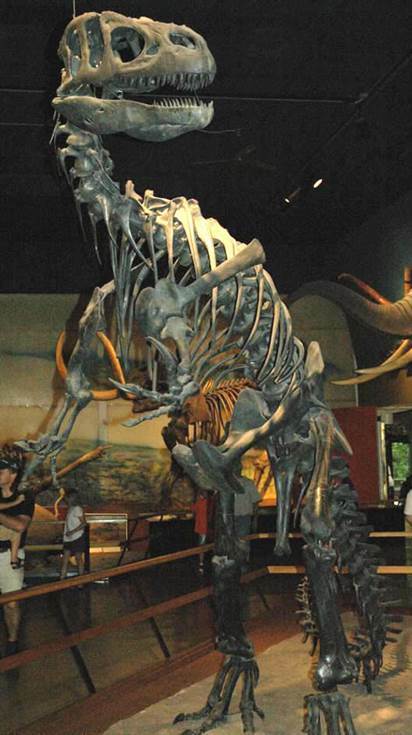 FMNH PR 2081 is 42 feet long (from snouth to tail tip) and stands 13 feet high (base of feet to top of hip). The skeleton is about 90% complete, lacking several neck bones, some portions of the thoracic vertebrae, portions of the distal-most tail vertebral elements, most of the left arm, and all of the left foot. 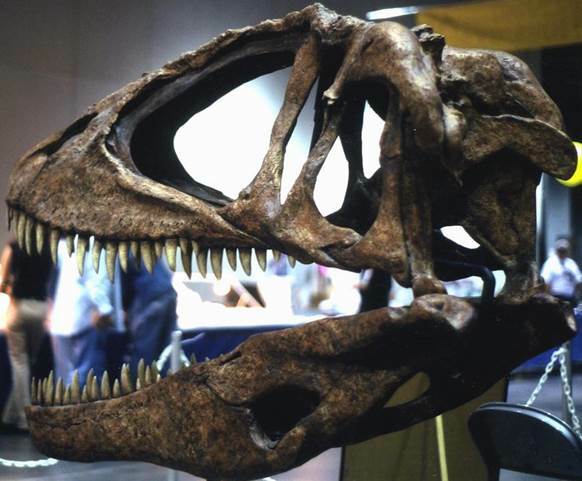 The most famous Jurassic-aged theropod is Allosaurus. It’s smaller than its Late Cretaceous relative Tyrannosaurus, but was still a top predator. 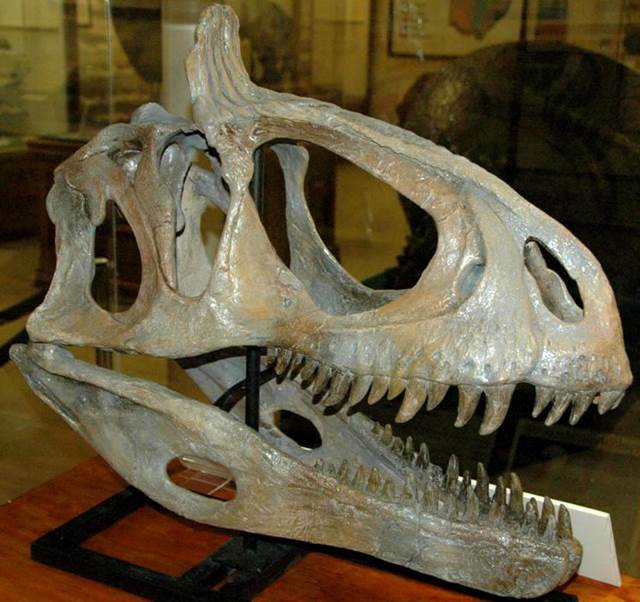 The species Allosaurus atrox (Marsh, 1878) is well known from numerous individuals found in the Morrison Formation (Tithonian Stage, upper Upper Jurassic) at the famous Cleveland-Lloyd Quarry in Utah, USA. Allosaurus atrox is only known from the Late Jurassic of western America. Allosaurus atrox (Marsh, 1878) in dynamic pose (above & below) - cast of a specimen from the Upper Jurassic at Cleveland-Lloyd Quarry, Utah, USA. 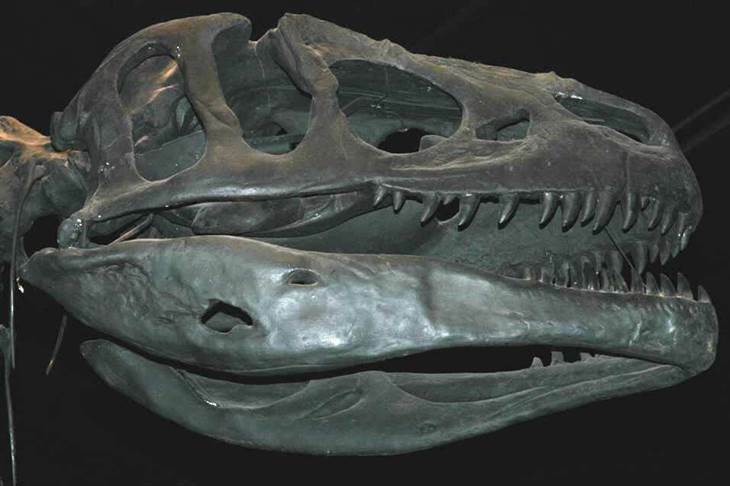 Allosaurus atrox (Marsh, 1878) - cast of a specimen from the Upper Jurassic at Cleveland-Lloyd Quarry, Utah, USA. Allosaurus atrox (Marsh, 1878) in a traditional, inaccurate pose (above & below). Skeleton from the Upper Jurassic at Cleveland-Lloyd Quarry, Utah, USA. 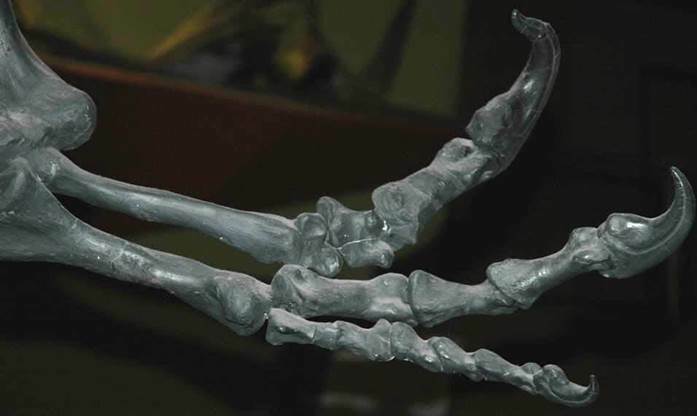 Allosaurus atrox (Marsh, 1878) hands (above & below). Skeleton from the Upper Jurassic at Cleveland-Lloyd Quarry, Utah, USA. A remarkable “pygmy” tyrannosaurid dinosaur was proposed in 1988 by Bob Bakker, Philip Currie, and Michael Williams on the basis of a well-preserved skull housed at the Cleveland Museum of Natural History (specimen CMNH 5741). 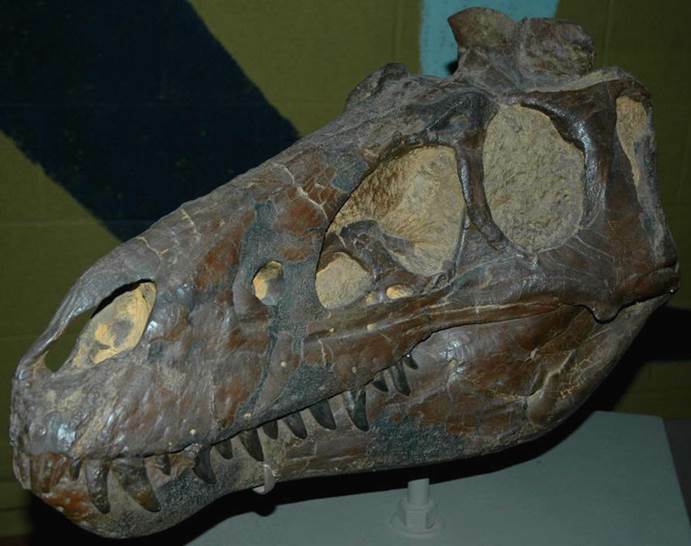 The skull of Nanotyrannus lancensis (Gilmore, 1946) was first discovered in 1942 in Carter County, southeastern Montana, USA, by a team from the Cleveland Museum of Natural History. Nanotyrannus was found in the Hell Creek Formation of late Maastrichtian age (near-latest Late Cretaceous - 67 million years). The original published description placed this species in the theropod genus Gorgosaurus (a junior synonym of Tyrannosaurus). 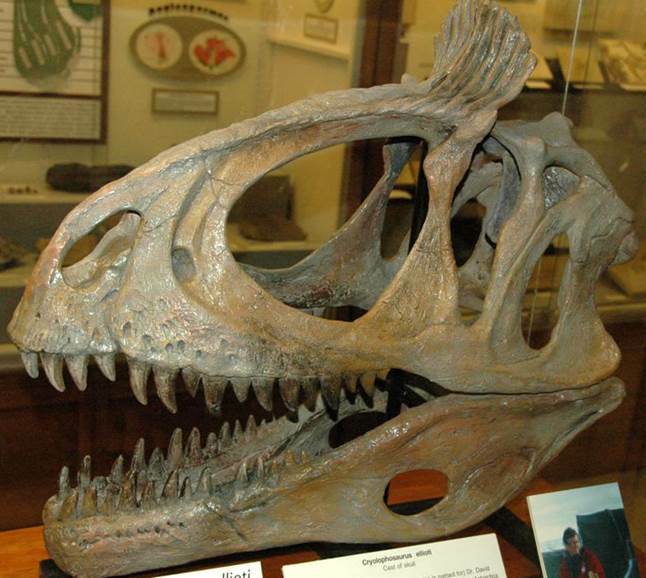 Re-examination (including CT-scanning) of this skull by dinosaurologist Bob Bakker in 1987 and 1988 resulted in taxonomic reassignment to a new genus altogether - Nanotyrannus (“pygmy tyrant”). 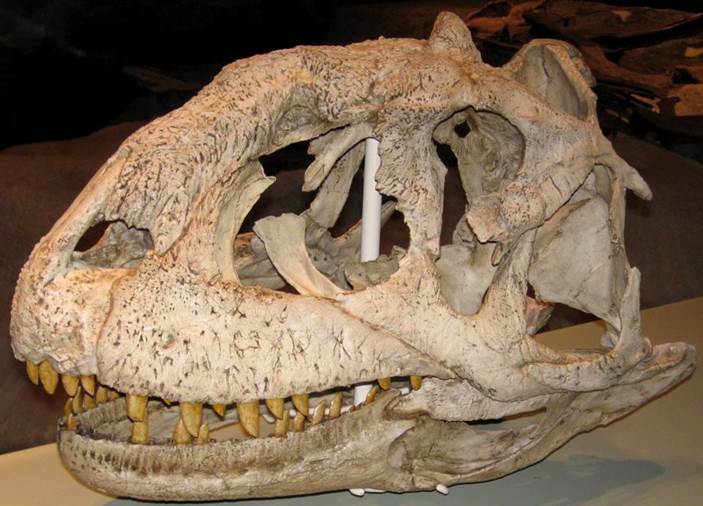 For a while, the new genus was being referred to as “Clevelanotyrannus”! 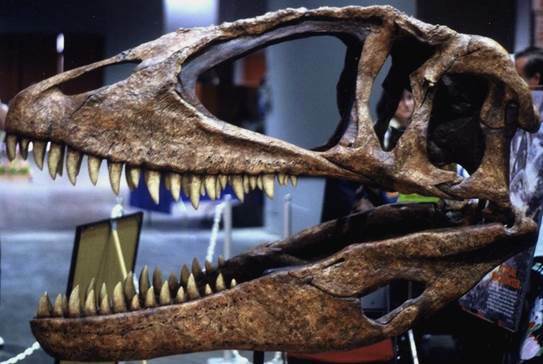 The skull is small for a tyrannosaurid dinosaur (60 centimeters long), but paleontologists have noted the well developed ossification of the skull (the head bones are tightly sutured), which is widely perceived to be a feature diagnostic of an adult individual. 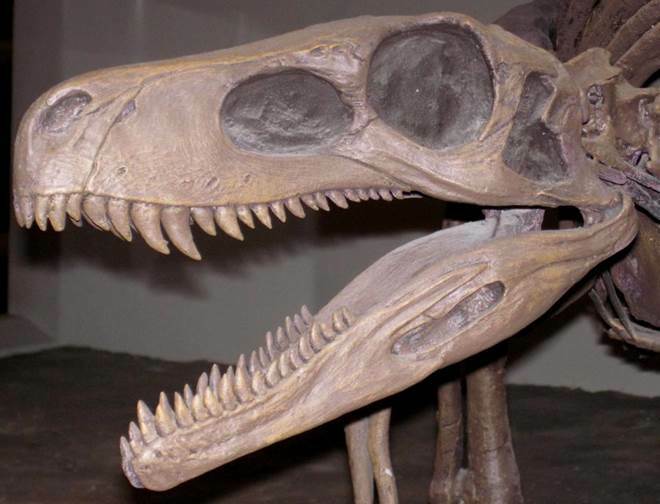 Other perceived adult aspects of the skull convinced Bakker that this was not a juvenile specimen of an otherwise large theropod dinosaur, but an adult of a miniature theropod (extrapolated to be about 5 meters total body length). If correctly interpreted, Nanotyrannus represents a clade of tyrannosaurid theropods that underwent evolutionary dwarfism very late in the history of dinosaurs. This biologic validity of Nanotyrannus has not been universally accepted. 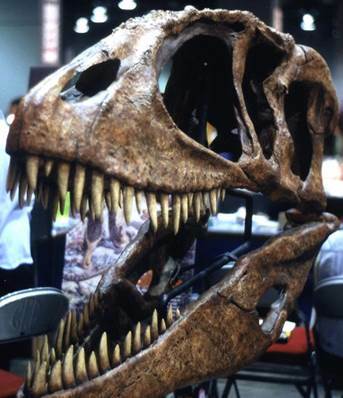 Gregory Paul (1988) was inclined to assign the species to Albertosaurus. Thomas Carr (1999) perceived that Nanotyrannus has morphologic features consistent with juvenile Albertosaurus. 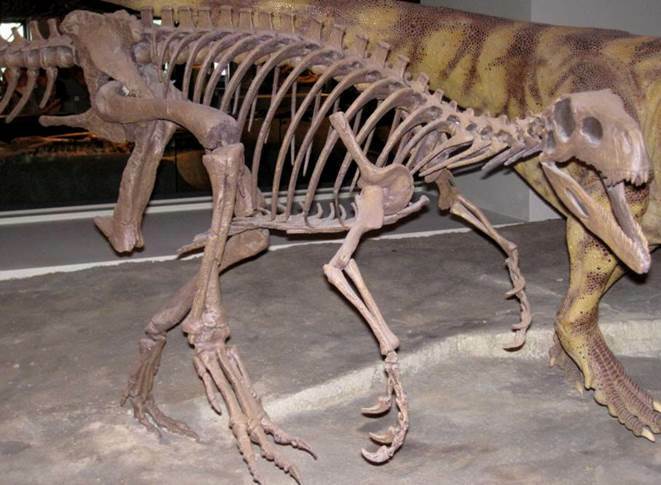 Philip Currie (2003) suggested that Nanotyrannus possibly represents an early ontogenetic stage (juvenile) of Tarbosaurus or Tyrannosaurus. Nanotyrannus lancensis (Gilmore, 1946) skull (60 cm long) from the near-uppermost Cretaceous of southeastern Montana, USA. This is the holotype specimen (CMNH 5741, Cleveland Museum of Natural History, Cleveland, Ohio, USA). Synthesized from Bakker et al. (1988), Paul (1988), Vogel (1988), Bakker (1992), Carr (1999), Currie (2003), and from information provided by the Cleveland Museum of Natural History. 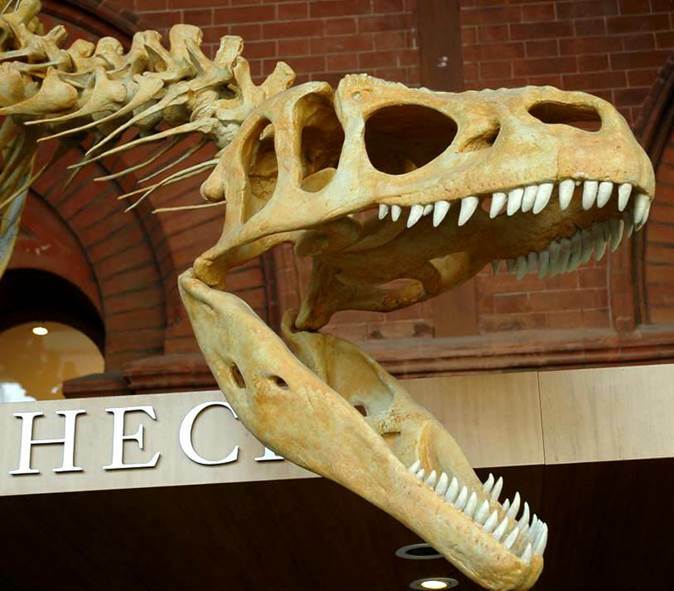 Carcharodontosaurus saharicus (Depéret & Savornin, 1927) is a famous theropod dinosaur from Africa. The species is known principally from a near-complete cranium plus pelvis material, upper & lower leg bones, toes, and some ribs & vertebrae. Remains have been reported from several localities in northern Africa (Morocco, Algeria, Tunisia, Niger, Sudan, and Egypt). 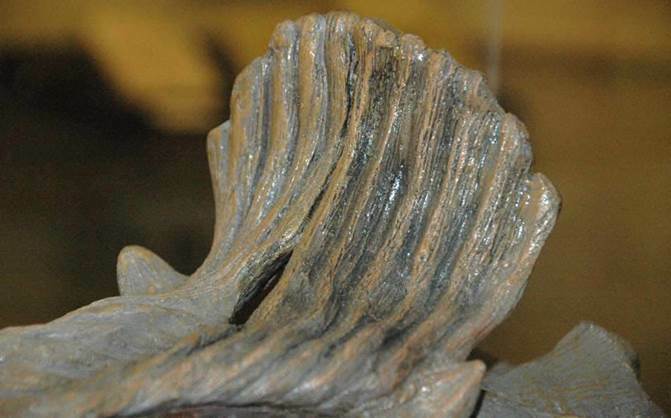 The best fossil specimen is a ~complete cranium found by Paul Sereno (University of Chicago). Carcharodontosaurus is inferred to have had a body size close to that of Tyrannosaurus rex. Stratigraphy: nonmarine deltaic sandstones, upper Kem Kem beds, Cenomanian Stage, lower Upper Cretaceous, 93-99 million years. Locality: Gara es Sbaa, Kem Kem region, southeastern Morocco (sensu stricto), northwestern Africa. 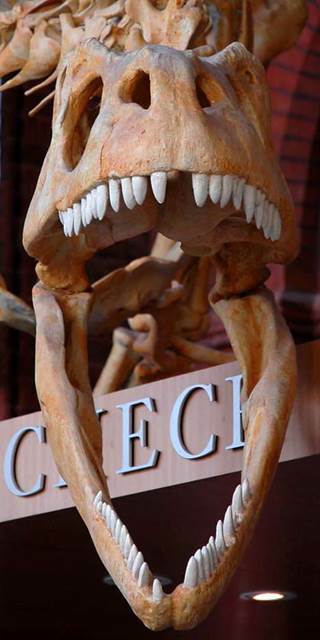 Carcharodontosaurus saharicus (Depéret & Savornin, 1927) - reconstructed skull (left-lateral view, ~1.6 meters long) from the Upper Cretaceous of southeastern Morocco. 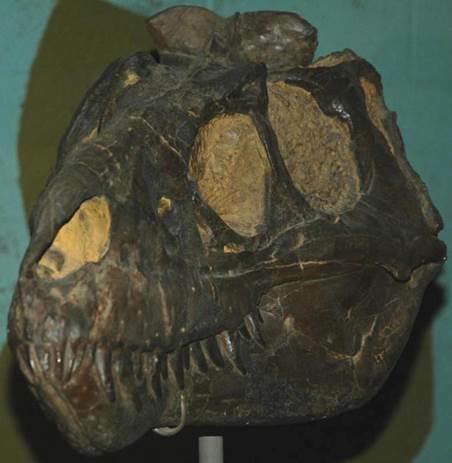 This skull reconstruction was based on the near-complete cranium SGM-Din 1 (Geological Survey of Morocco’s dinosaur collection). Carcharodontosaurus saharicus (Depéret & Savornin, 1927) - reconstructed skull (oblique left-lateral view & anterior view) from the Upper Cretaceous of southeastern Morocco. 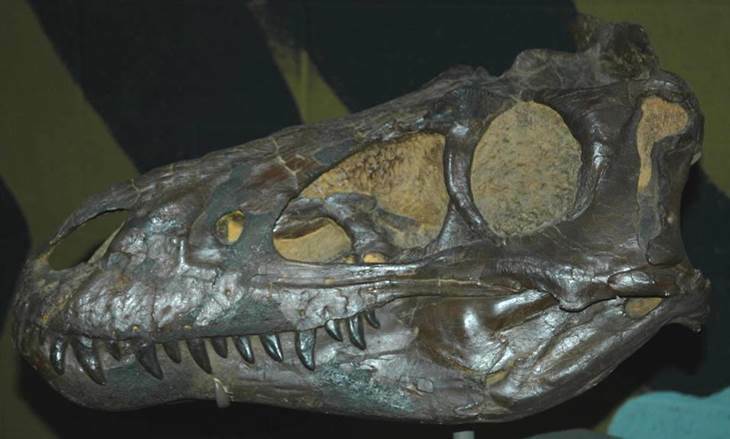 Carcharodontosaurus saharicus (Depéret & Savornin, 1927) - reconstructed skull (oblique left-lateral view) from the Upper Cretaceous of southeastern Morocco. Most info. from Sereno et al. (1996) - Science 272: 986-991. Cryolophosaurus ellioti Hammer & Hickerson, 1994 is the most significant dinosaur ever discovered in Antarctica, and the only known theropod having a prominent bony crest atop its skull. It was discovered in 1991 by Ohio State University geologist David Elliot, after whom the species is named. The discovery locality is Mt. 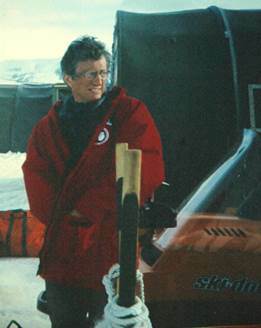 Kirkpatrick in the Beardmore Glacier area, Queen Alexandra Range, Transantarctic Mountains. Elliot was doing field work on the Jurassic-aged Kirkpatrick Basalt and found a large femur sticking out of tuffaceous siltstone rocks. Next to the femur was the cross-section of a jaw. Excavations recovered ~130 bones from about 2½ tons of rock. 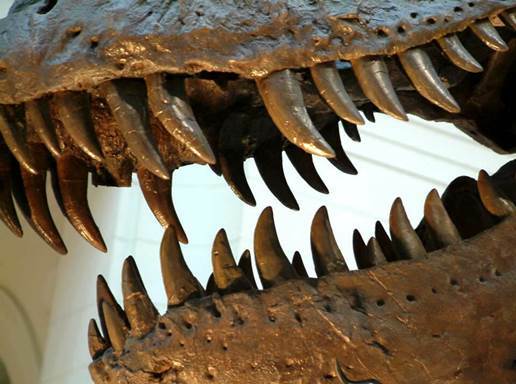 At least three dinosaur species have been identified, along with pterosaur and mammal remains. The available Cryolophosaurus material includes the posterior portion of a skull, a partial vertebral column, pelvis and hind leg material. The anterior skull had been glacially eroded away. The front portions of the reconstructed skull shown below is based on anatomical information from other theropod dinosaurs. Intriguingly, prosauropod ribs were found in the mouth of this Cryolophosaurus. Many vertebrate paleontologists who have examined the bones agree that this indicates that the animal choked on them, causing death. The entire animal has been estimated to be 20-25 feet long, about 5 feet tall at the hips, and weighing almost 1200 pounds. The enclosing sediments were deposited in a fluvial setting, in a relatively warm subpolar paleoenvironment (between 60° and 70° South paleolatitude). David Elliot, Ohio State University geologist who discovered Cryolophosaurus. Cryolophosaurus ellioti Hammer & Hickerson, 1994 skull cast (above & below) from the Lower Jurassic of the Transantarctic Mountains (OSU public display, Orton Geology Museum, Ohio State University, Columbus, Ohio, USA). Cryolophosaurus ellioti Hammer & Hickerson, 1994 skull crest (cast) from the Lower Jurassic of the Transantarctic Mountains (OSU public display, Orton Geology Museum, Ohio State University, Columbus, Ohio, USA). Notice the small horns on either side of the base of the crest. The crest is fairly thin, so it’s too delicate to be a defensive structure. It has been interpreted as a display feature. 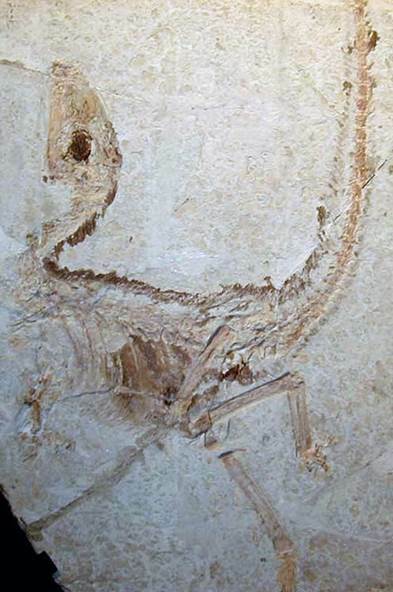 Sinosauropteryx prima Ji & Ji, 1996 - holotype specimen (part) from the Lower Cretaceous of Liaoning, China (NGMC 2123, National Geological Museum of China, Beijing, China). Sinosauropteryx prima is the first ever discovered feathered dinosaur. A relative abundance of feathered dinosaurs and early birds has been found in the Jehol Group of northeastern China. The most famous & most frequently illustrated Sinosauropteryx specimen is the holotype, which consists of part & counterpart slabs (each is housed at separate institutions in China). The dark fringe running down the neck, back & tail represents feathers. This animal was a relatively small theropod dinosaur. Locality: Sihetun Quarry, Shangyuan, Beipiao City, Liaoning Province, northeastern China. Herrerasaurus ischigualastensis Reig, 1963 (above & below) - early theropod dinosaur from the upper Middle Triassic Ischigualasto Formation of northwestern Argentina (Field Museum of Natural History, Chicago, Illinois, USA). Majungasaurus atopus (Sues & Taquet, 1979) from the Upper Cretaceous of the Mahajunga Basin, Madagascar (FMNH PR 2100, Field Museum of Natural History, Chicago, Illinois, USA).